To develop a strong visual identity for the project. Owen briefed me to create something which would become instantly recognisable and memorable, and have a warmth and joyfulness to it, to evoke the lives being shared and celebrated within the app. The identity also needed to appeal to a range of audiences and fit within the social networking and mobile-first online application environment. I wanted the identity to have a vibrancy to it, and to portray the idea that these 'remarkable lives' consist of many stories and memories ... a personal history of many parts or a kind of virtual scrapbook. The concept for the brand mark evolved from a multicoloured grid which felt reminiscent of patchwork or retro coloured tiles, with the R of Remarkable also signifying a person in icon form. The resulting brand mark has been designed for flexibility, working as a circular 'badge' or as single colour/monotone versions with transparency. 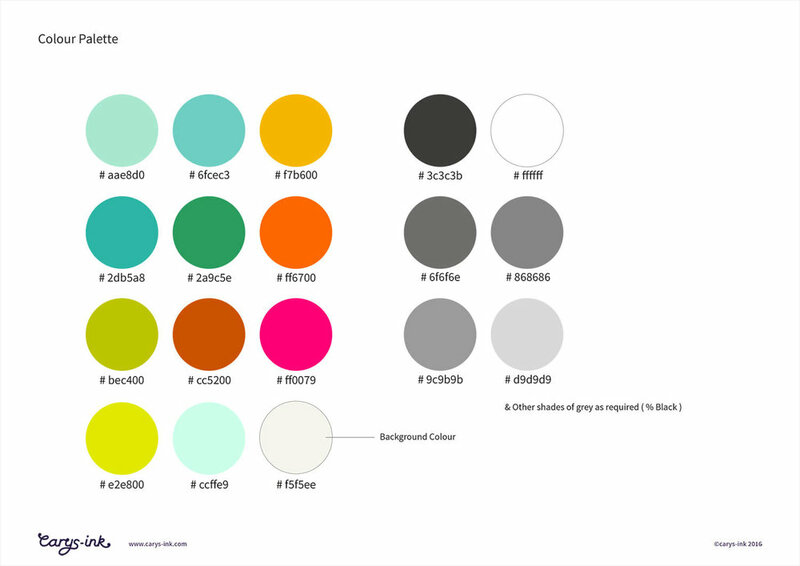 Pictured below are a few other pages from the brand delivery guide, outlining for example, the colour palette and fonts to be used as part of the Remarkable Lives brand, as well as guidance on sample usage. 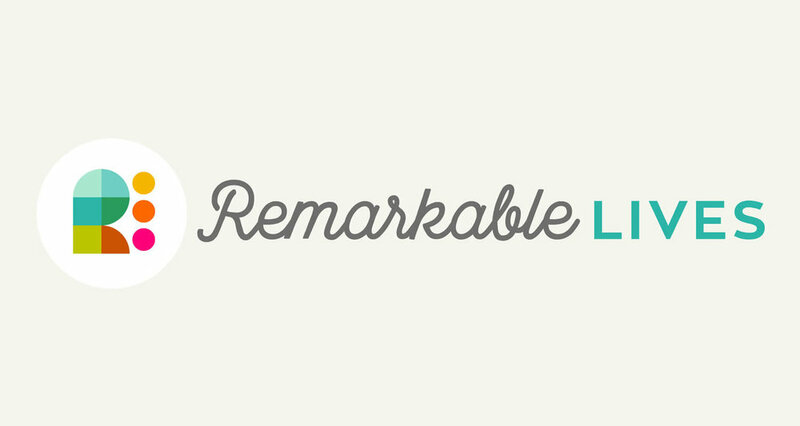 Following on from the creation of the identity for Remarkable Lives, the project has continued to develop and the client has been through a period of searching for and securing funding from various sources. I continued to work with Owen as he successfully fulfilled a Kickstarter campaign and there have been various materials created, implementing the RL brand. Pictured below are some promotional postcards, a mini badge set and business cards, along with a publication mock-up. The stories for the publication are currently being collated together and I will be putting together the design for this in due course. What were your reasons for selecting Carys to design the brand identity - Was there anything specific you thought she would bring to the project? 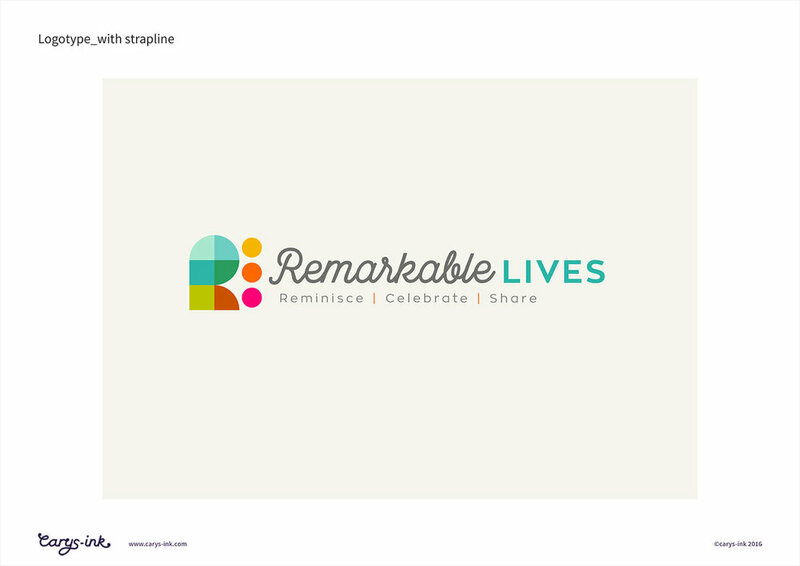 We wanted to work with a designer who would, above all, understand and therefore be able to articulate visually the brand essence of Remarkable Lives. We’re a startup with a social mission, but there was no background (which might be helpful) or baggage (which might be unhelpful) for Carys to work with. From her illustration and branding portfolio, we felt Carys demonstrated the combination of experience and insight that would convey the personality of our brand: warmth, joy, celebration, compassion, care, kindness, optimism, inclusivity. In developing and designing this particular identity, what were the most important and difficult challenges to overcome do you think? On a practical level, we had a tight budget. On a creative level, one of our particular challenges is how we communicate and engage our different demographic audiences and it was essential to design a brand identity that could deliver for all. The demographic at the centre of our mission is older people: the 11.6 million people aged 65 or over in the UK, especially the 3.5 million who live alone and the 425,000 in residential and nursing homes. But the typical ‘user’ of the Remarkable Lives platform is primarily going to be younger – a family member or carer who is comfortable and intuitively familiar with social networks. So, the challenge was to design a brand that older people would warm to (and not be put off by) that would equally appeal to younger generations as well as fulfil certain expectations of a tech platform. An additional challenge for Carys was that my co-founder and I are control freaks. Was Carys successful in finding good solutions to these challenges? Budget - Carys was understanding and proposed solutions that were sensible and realistic. Creative – We think so! And our new identity has been enthusiastically received by all audiences, and that’s what matters most. Everyone likes the rich, bold and vibrant colour palette (so different to much of what exists in the landscape of later life), the optimistic, almost tactile graphic motif, and the flowing informality and friendliness of the font. How did you find the whole design process, from the initial briefing through to the completion of your project? Carys managed the process with a refreshing level of professionalism, efficiency and client care. We had a timeline and she was happy to work to that; she communicated really well so that we knew where we were and what to expect throughout the process. She was really patient with us, though I don’t think we were too demanding. More that we had particular ideas in response to the first concepts and she really listened and worked with us. She took all our feedback on board and then, and this is the best bit, completely delighted us with how she developed the selected design. Actually, it was one of the most pain-free and enjoyable moments in our startup journey. If you had to describe Carys to someone looking to commission their own brand identity what would you say? You’re in a very safe pair of hands, and not in a boring predictable way. Of course, we would always recommend to anyone that they put the time and effort into preparing the creative brief (and we hope we did that) because this is a two-way process. Despite being control freaks, we are also highly collaborative and really appreciated that in Carys as well. How would we describe Carys in a less rambling way? Professional. Efficient. Friendly. Highly skilled. Communicative. A complete package.